DUBAI, November 8, 2017 – Gulf capital market regulators underscored on Monday the actions they have taken to stimulate the region’s bond and sukuk market. The announcements came as The Gulf Bond and Sukuk Association (GBSA), the trade association representing the Arabian Gulf fixed income market, gathered industry leaders and government regulators at its Regional Debt Capital Market Summit at The Ritz Carlton, DIFC in Dubai. 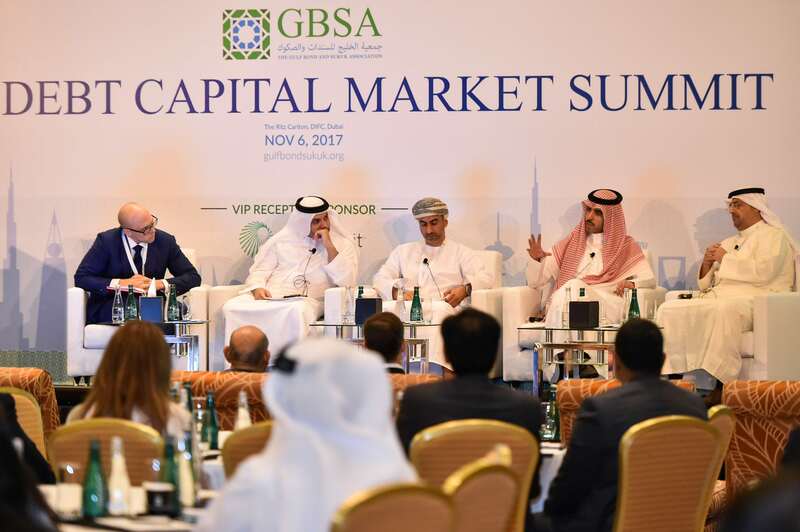 GBSA’s summit, held in Dubai on Monday was attended by more than 200 executives from leading companies, international and regional investors, market participants and government officials as well as senior representatives of the capital market regulators of Kuwait, Oman, Saudi Arabia and the United Arab Emirates. The regulators announced several initiatives that will streamline access to their markets for issuers and investors. Ali Al Khalil, Chief Operating Officer, Kuwait Financial Centre-MARKAZ delivered the keynote address in which he said, “The region has plans for projects worth $2.6 trillion in the near future. Even if half of these projects come to realization, the funding requirement will be approximately 100% of GDP, requiring further issuances of debt securities”. Andy Cairns, Group Head of Corporate Finance, First Abu Dhabi Bank and Chairman of the GBSA Regional Board of Directors said: “GCC capital markets have never been busier with 2017 Bond and Sukuk issuance exceeding syndicated loan volumes for the first time. GBSA is championing this development and it was reassuring to hear from today’s event speakers that there is consensus on a continuing positive outlook for the region’s capital markets. GBSA is playing a leadership role as an association at this exciting time”. Panel discussions covered the funding environment for companies, global investors’ views on the region, introducing more structured bonds, the outlook for market liquidity, financing green investment and current issues in the sukuk market. The event was made possible by Platinum Sponsor Kuwait Financial Centre – MARKAZ and Gold Sponsors Dentons, Emirates NBD, Euroclear, First Abu Dhabi Bank, Lootah Capital, Natixis, Pillsbury Winthrop Shaw Pittman and S&P Global Ratings. IHS Markit sponsored a gala VIP reception the evening before the conference.